Samimi Orthopaedic Group (West Covina) - Book Appointment Online! 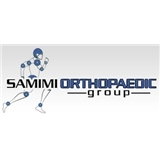 At Samimi Orthopaedic Group we strive to provide compassionate, individualized and innovative Orthopedic care. We understand the importance of musculoskeletal health and it is our mission to return our patients to their previous functional activity level. Using the latest minimally invasive techniques we endeavor to decrease recovery time and minimize pain. Along with our friendly and dedicated staff we pride ourselves on treating each patient like family and making them feel comfortable and informed at each stage of the healing process. We look forward to helping you feel better and on the road to recovery.